The second in a series of collectible ornaments featuring the Pembroke Welsh Corgi from the PWCCA Charitable Trust. 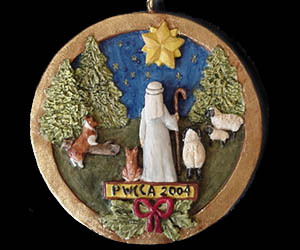 The 2004 Ornament, designed by Stephanie Hedgepath, depicts a shepherd with his sheep and trusty Corgis watching the great star of Bethlehem. Please choose "Domestic" or "Foreign" shipping.